Proposed rendering of the Malden River Greenway looking south towards downtown Boston (credit: Utile Design). 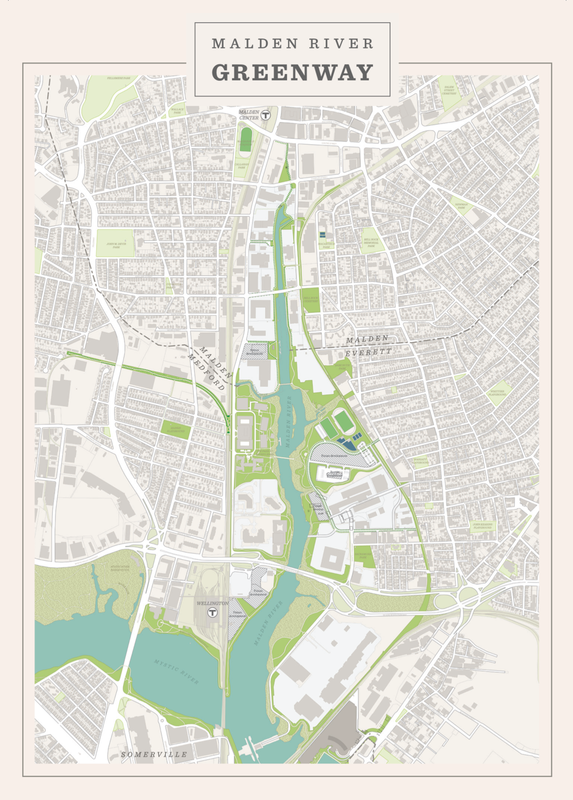 MyRWA is working to create a shared vision for a seamless waterfront park system along both sides of the Malden River, connecting communities in Medford, Malden and Everett to this important natural resource. Currently, a little more than 1 mile of the 3.5 miles of shoreline is accessible green space – this is a result of generations of industrial uses. Thanks to local leadership and several brownfield redevelopments, the Malden River is on its way to becoming a central open space amenity for all three cities. Over the course of 2017, MyRWA partnered with cities, local developers/businesses, community groups and citizens to create a comprehensive vision that will support the implementation of vibrant and connected parklands along the river. Utile, the design consultant, created a master plan and recommendations for new parks, paths, and boating amenities along the Malden River. Notes and drawings from the small group discussion on August 4 can be viewed here. We will continue to accept comments via an online mapping survey to allow stakeholders to pinpoint parts of the Malden River they love as well as areas that need improvement. Check out photos from the planning process below. For updates, sign up for our enewsletter or contact Greenways Director Amber Christoffersen. This project is a partnership between the Mystic River Watershed Association, cities of Everett, Malden and Medford, Bike to the Sea, Friends of the Malden River, Lawrence and Lillian Solomon Foundation (A Greener and Greater Boston), Preotle, Lane and Associates, and Wynn Boston Harbor.